Welcome to Welcome Home Wednesdays number 28! That’s only two away from week 30! Score! I was so thrilled to see all the fantastic projects you liked up this past week and meet some new friends! Here’s a look at several Inexpensive DIY Projects You Could Totally Do from last week’s party! 6. 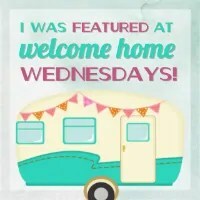 Please note that by sharing at Welcome Home Wednesdays, you are giving permission for your projects to be shared on social media and in round up posts on any of the cohosts sites. 7. That’s it! Have fun and link up your best stuff! We can’t wait to see it! Like any good hosts we’re sitting right by the present table waiting until our guests leave so we can go through the loot… the loot being your links! We can’t wait to check out what you’ve left for us. Trust me there will be a lot of pinning, tweeting and facebook sharing going on in the near future… we can’t wait to show off what you’ve left!! Hi Erin, thank you so much for featuring my Coffee tin planter! Made me so happy 🙂 Have a great Wednesday! I love simple and easy projects, Katrin! Thanks for partying! Thanks so much for hosting Erin!! Love seeing all the great projects! Thanks for linking up, Megan! Hi Erin! I just found out about the link party on FB so I hooked up my rusty cans. Thanks for hosting, and have a Great Day! Perfect! Thanks for coming by! See you next week! Thanks for coming by, Chrissa! See you next week! Erin, I just had to pop back in…I just got done visiting several guests and I learned so much in 15 minutes! From fizzy fruit, to foods that are good to eat hot, to ebate cash back butons to best neutral paint colors from Sherwin Williams! Holy cow…when I go to bed tonight I will be much smarter than I was when I woke up this morning! This is my first time linking up here. Love the blog! The projects you chose are awesome and so worth trying. I love home décor DIY. I’ve done quite a few projects myself but haven’t blogged about it yet. It’s all in the safe waiting to be unleashed. One day I’ll have it up. Thanks for stopping by, Rania! You could totally do a DIY project! Give it a try! I’m so glad you stopped by, Dee! So nice to see you!